Municipal tap water is treated with a variety of chemicals and additives to help improve its safety. Unfortunately, many of these chemicals cause safety concerns of their own. 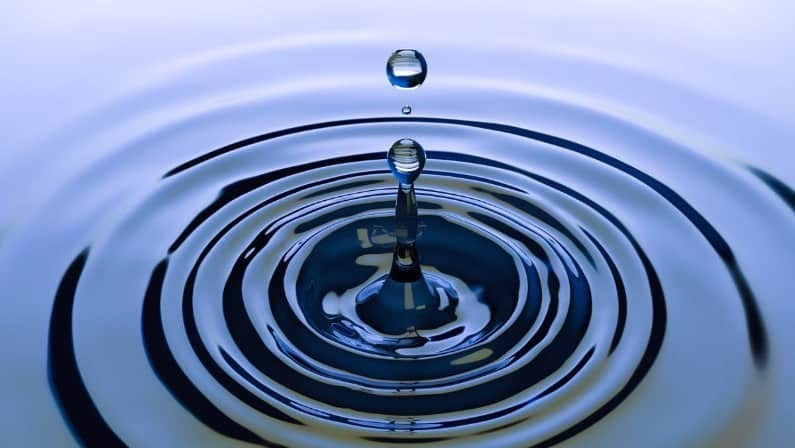 One very common water treatment chemical is chlorine – which may be harmful to human health, according to several recent studies. So, many choose to use a water filter to remove chlorine and other contaminants out of their drinking water – which is a great idea! In this guide, we’ll help you find the best chlorine filter of 2019. There are many different chlorine water filters on the market, which can make it difficult to choose. There’s several different types of water filters, each with their own unique pros and cons. To help you choose, we’ve picked a top option from each main category – reverse osmosis, whole house filters and filtered water pitchers. See our top picks in the guide below. These selections were made based on a combination of our own testing and research, manufacturer specs, and third party chlorine filter reviews. 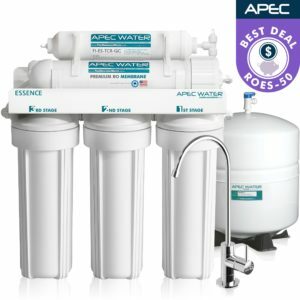 The APEC ROES-50 is perhaps the best chlorine filter on the market. It utilizes reverse osmosis technology – and reverse osmosis filtering is considered to be one of the most effective at removing chlorine. The ROES-50 is an affordable yet highly effective RO system. It’s designed to filter out 99% of contaminants, including chlorine, lead, fluoride and more. In fact, the manufacturer claims that it’s effective in removing more than 1,000 different contaminants! 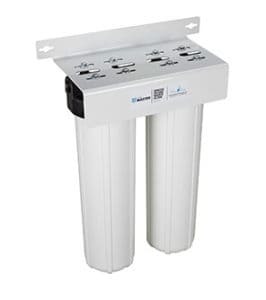 This unit is among the best reverse osmosis filters on the market. The APEC ROES-50 consistently earns high ratings from customers and critics alike, and is a best-seller on Amazon. In chlorine filter reviews, it always ranks quite high – and we tend to agree. It performs well, lasts a LONG time, and is backed by a full 2 year warranty. The unit itself installs under your sink, and it comes with a faucet to install on your kitchen sink. Given the high quality construction, long warranty and the reputation of the manufacturer, you’d expect this product to be a bit on the pricey side – but it’s not! The ROES-50 is actually very affordable, and long-term costs are also quite low, as the filters last for a long time. Click here to learn more. The Home Master HMF2SDGC is one of the best whole-house water filters on the market, and also a fantastic chlorine water filter. It’s designed to provide filtered water to your WHOLE house, from the kitchen sink to the guestroom shower. The unit installs in a central location and ties in to your whole plumbing system. It’s designed to provide adequate water pressure and flow for a midsize house, although it could slow your water pressure a bit when it comes to showering. The water pressure is rated for 15 gallons a minute. The Home Master is among our top recommendations for whole-house water filters. The nice thing about a whole-house filter is that you can have the piece of mind of drinking and using filtered water in every room of your house. Alternatively, you could also go with a filtered shower head and a kitchen sink filter, but that requires two devices. The Home Master is rated to remove up to 95% of contaminants, including chlorine. A single filter can last up to 95,000 gallons, which should cover about 1 year of use for a 4-person family. This well-rated, affordable whole-house system is backed by a 2 year warranty. It consistently earns great reviews from customers, and it’s been highly effective in testing. One thing to note: this unit is designed for households with tap water from municipal sources – if you’re on a well system, check out our pick for well use. If you’re ready to buy or check reviews, click here to learn more. The AquaGear Water Filter Pitcher is one of the best chlorine filter options if you’re looking for a simple pitcher-style setup. This unit requires no installation or experience – you simply fill it with tap water, and pour out filtered drinking water as needed. This style is good for drinking water, but obviously won’t work too well for cooking, showering, etc. With that said, this is an affordable, easy way to start filtering your drinking water. 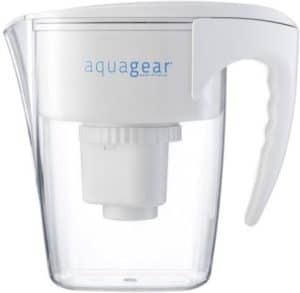 The AquaGear is on the higher end in the world of filtered water pitchers (see other good options here), although it’s still quite affordable. It offers an advanced 5-stage filtration system that is NSF certified for the removal of lead, fluoride, chlorine and other contaminants. Another unique thing about the company behind AquaGear is that they donate to support people in developing nations without regular access to clean drinking water! If you want a chlorine filter water pitcher, this is the best option we’ve found. Click here to learn more about the AquaGear. Why is Chlorine Added to Drinking Water? Is Chlorine Safe? Chlorine is a chemical that’s commonly used to treat drinking water, and added to already treated drinking water through a process called chlorination. It is effective in killing off bacteria and microbes, helping to improve the safety of the drinking water. A whopping 98% of water utilities in the United States use chlorine. Chlorine use has significantly reduced the spread of waterborne diseases over the decades, and overall it’s an effective way to treat water. Unfortunately, research is emerging that chlorine might not be as safe as we once thought. The primary concern is that chlorine may increase the risk of developing cancer. Unfortunately we do not yet have definitive evidence to say if chlorine is safe or not, but it’s certainly something to do your own research on if you have concerns. Taste – Filtered water generally tastes better and cleaner than standard tap water. Chlorine in particular has a very chemical taste to it, that often reminds people of getting a mouthful of pool water. Using a good water filter can help improve the taste and odor of your water – which may just inspire you to drink more of it! Safety – Tap water can contain any number of potentially harmful contaminants, as well as leftover treatment chemicals like chlorine. Chlorine is widely used because it’s effective at killing bacteria and sanitizing drinking water supplies. Unfortunately, drinking chlorinated water has been linked to an increased risk of certain cancers, as well as several other serious health concerns. Peace of Mind – Tap quality can vary significantly from town to town. And even if your area has good drinking water, the condition of the pipes leading to your house could also cause contaminants to enter your water! Using a filter is a cheap and easy way to buy significant peace of mind, knowing that you’re consuming clean, safe drinking water. Filter Technology – There are several different types of water filters out there. We focused on filtration methods that are effective at removing chlorine. Reverse osmosis appears to be the most effective, but smaller setups and even water pitchers can work, so long as they use advanced multi-stage filtration tech. Value – We focused on choosing excellent products at fair prices. We certainly didn’t pick the cheapest models out there, but instead focused on products that offered significant value while delivering superior results. Reviews – To round out our own findings, we researched third party chlorine filter reviews from real customers. This helped us get a better idea of how each filter performed with various water qualities, as well as how long the filters tend to last. Durability – Although affordable, most of the best chlorine filter options are still a decent upfront investment. So, we focused on models that are built to last for a long time. Looking for a different type of filter? Check out our detailed guide to the best water filters overall.